The Templar Order was established in 1118 to ensure the custody of the Holy places and to protect the pilgrimage ways. The Knights Templar considered themselves knights of God, upholding the honor of the church and Christianity. The Templars fought along side King Richard I (Richard The Lion Hearted) and other Crusaders in the battles for the Holy Lands. It was a very well organized military force and they were the clash forces in all the Crusades.Their motto was “NON NOBIS, DOMINE, NON NOBIS, SED TUO NOMINI DA GLORIAM “. -"Give Glory, not for us, God, not for us, but for your name". A Templar Knight is truly a fearless knight, and secure on every side, for his soul is protected by the armor of faith, just as his body is protected by the armor of steel. He is thus doubly-armed, and need fear neither demons nor men." 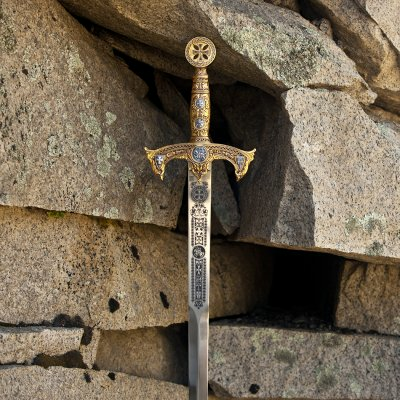 With a 34-1/2 inch tapered blade designed to act both as a thrusting tool for penetrating the joints in plate armor and chain mail, and as a heavy duty hacking tool for splitting skulls and helms alike. 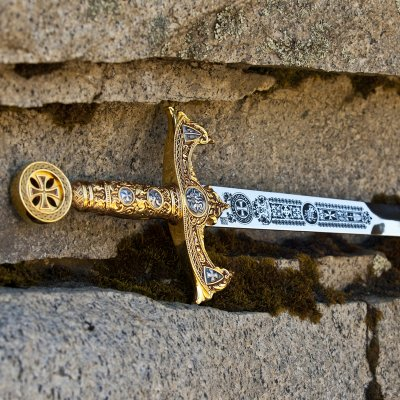 The Sword represents the Knight's right to dispense justice. 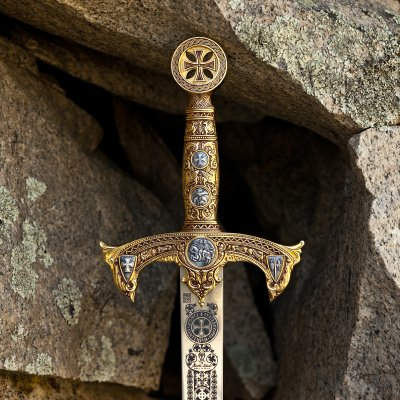 The double edge of the blade ever reminds the Knight to temper justice with mercy. As the steel of the Sword must be tempered in fire and water, so must the soul of the Knight be tempered by adversity and compassion. The Knight was sworn that his sword was never to be drawn in anger. The price of shipping is included.